Arc-fault circuit interrupters (AFCIs) are special types of electrical receptacles or outlets and circuit breakers designed to detect and respond to potentially dangerous electrical arcs in home branch wiring. AFCIs function by monitoring the electrical waveform and promptly opening (interrupting) the circuit they serve if they detect changes in the wave pattern that are characteristic of a dangerous arc. They also must be capable of distinguishing safe, normal arcs, such as those created when a switch is turned on or a plug is pulled from a receptacle, from arcs that can cause fires. An AFCI can detect, recognize, and respond to very small changes in wave pattern. 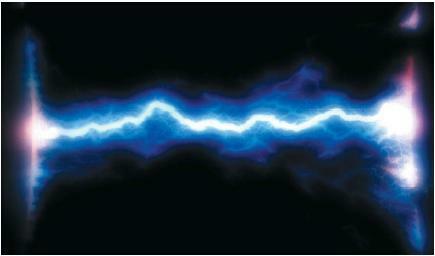 When an electric current crosses an air gap from an energized component to a grounded component, it produces a glowing plasma discharge known as an arc. For example, a bolt of lightening is a very large, powerful arc that crosses an atmospheric gap from an electrically charged cloud to the ground or another cloud. Just as lightning can cause fires, arcs produced by domestic wiring are capable of producing high levels of heat that can ignite their surroundings and lead to structure fires. According to statistics from the National Fire Protection Agency for the year 2005, electrical fires damaged approximately 20,900 homes, killed 500 people, and cost $862 million in property damage. 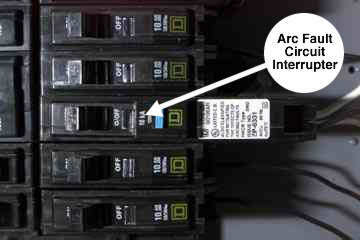 Although short-circuits and overloads account for many of these fires, arcs are responsible for the majority and are undetectable by traditional (non-AFCI) circuit breakers. Where are arcs likely to form? Arcs can form where wires are improperly installed or when insulation becomes damaged. In older homes, wire insulation tends to crystallize as it ages, becoming brittle and prone to cracking and chipping. Damaged insulation exposes the current-carrying wire to its surroundings, increasing the chances that an arc may occur. electrical cords damaged by vacuum cleaners or trapped beneath furniture or doors. damage to wire insulation from nails or screws driven through walls. appliance cords damaged by heat, natural aging, kinking, impact or over-extension. loose connections in outlets, switches and light fixtures. Locations in which AFCIs are required depend on the building codes adopted by their jurisdiction. E3802.12 Arc-Fault Protection of Bedroom Outlets. All branch circuits that supply120-volt, single-phase, 15- and 20-amp outlets installed in bedrooms shall be protected by a combination-type or branch/feeder-type arc-fault circuit interrupter installed to provide protection of the entire branch circuit. The circuit conductors between the branch circuit overcurrent device and the arc-fault circuit interrupter are installed in a metal raceway or a cable with metallic sheath. Dwelling Units. All 120-volt, single phase, 15- and 20-ampere branch circuits supplying outlets installed in dwelling unit in family rooms, dining rooms, living rooms, parlors, libraries, dens, sun rooms, recreation rooms, closets, hallways, or similar rooms or areas shall be protected by a listed arc-fault circuit interrupter, combination-type installed to provide protection of the branch circuit. Home inspectors should refrain from quoting exact code in their reports. A plaintiff’s attorney might suggest that code quotation means that the inspector was performing a code inspection and is therefore responsible for identifying all code violations in the home. Some jurisdictions do not yet require their implementation in locations where they can be helpful. What types of AFCIs are available? 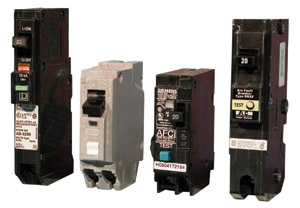 AFCIs are available as circuit breakers for installation in the electrical distribution panel. Check that the load power wire, panel neutral wire and load neutral wire are properly connected. Check wiring to ensure that there are no shared neutral connections. Check the junction box and fixture connections to ensure that the neutral conductor does not contact a grounded conductor. It is important to distinguish AFCI devices from Ground Fault Circuit Interrupter (GFCI) devices. GFCIs detect ground faults, which occur when current leaks from a hot (ungrounded) conductor to a grounded object as a result of a short-circuit. This situation can be hazardous when a person unintentionally becomes the current’s path to the ground. GFCIs function by constantly monitoring the current flow between hot and neutral (grounding) conductors, and activate when they sense a difference of 5 milliamps or more. Thus, GFCIs are intended to prevent personal injury due to electric shock, while AFCIs prevent personal injury and property damage due to structure fires. In summary, AFCIs are designed to detect small arcs of electricity before they have a chance to lead to a structure fire. How Long Should the Components of a House Last?